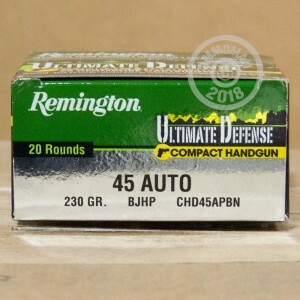 This case of 500 rounds from Remington's Ultimate Defense series offers an excellent value for those seeking to train and carry with top quality ammo. 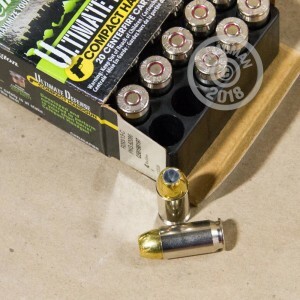 Each .45 ACP cartridge fires a 230 grain jacketed hollow point bullet with a brass jacket that delivers excellent penetration for more reliable results against assailants in self-defense situations. 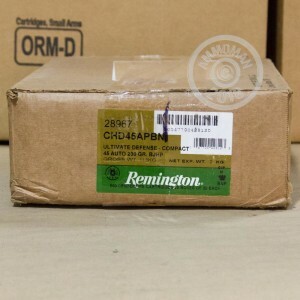 Remington Ultimate Defense ammunition is made in Lonoke, Arkansas using non-corrosive Boxer primers and nickel-plated brass cases. Buy this case (or any items totaling $99 or more) and get free shipping from AmmoMan.com!